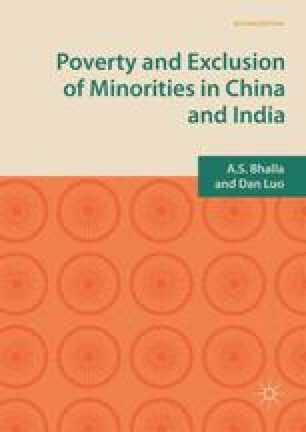 In this chapter is devoted to a quantitative analysis of poverty incidence among minorities over time in China and India, using several indicators: (1) headcount ratios, (2) monthly per capita consumer expenditure and (3) poverty—gap ratios (PG), and Foster-Greer-Thorbecke (FGT) ratios. Empirical evidence shows that both countries have achieved substantial reduction of rural and urban poverty during the last two decades for minorities as well as for the majority. Both countries have implemented anti-poverty programmes which are not always targeted specifically for minorities.